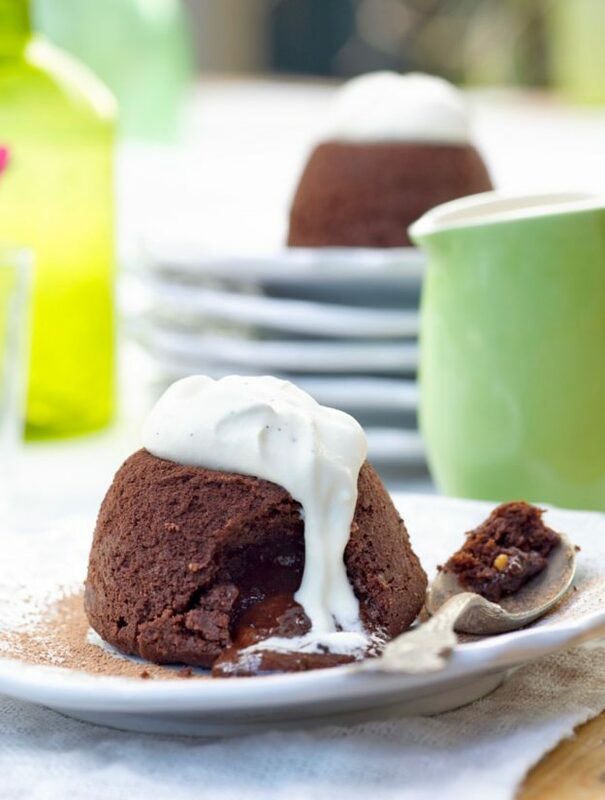 These luscious puddings are great entertaining food, as they can be made the day before, chilled overnight, and then cooked just before you’re ready to serve. 1 Start preparations the day before. Grease 10 x 1/2 cup capacity individual cake tins and lightly dust with flour. Place chocolate, butter and peanut butter in a bowl and microwave to melt. Stir until smooth. 2 In a clean bowl, whisk sugar and eggs until mixture begins to turn pale (about 3 minutes) – don’t over beat or cakes will collapse after baking. 3 Fold chocolate mixture into egg mixture and when almost fully incorporated, then fold in flour. Spoon mixture into prepared tins; place tins on a tray. Cover with plastic wrap and refrigerate overnight. 4 When ready to cook, remove tins from fridge while preheating oven to 230°C. Transfer cake tins to an oven tray and bake for 9-10 minutes. The outer cake should be set but the inside still liquid. Turn out and serve immediately with Chantilly cream, made by adding sugar and vanilla to whipped cream.